Syntax Highlighting in Vim inside iTerm2 requires few lines of coding. All PHP, HTML etc. files will open in translucent iterm2 with nice syntax highlighting. If you are landing from somewhere else and not our regular reader, you need some extra tips. First, cool down your head, finding any profile file, any odd named file will never be required. You will not need to fight to find an odd named file on your OS X 10.8.x for Syntax Highlighting in Vim inside iTerm2. Those who are landing as newcomers. Thing is that, there is a quite interesting guide we wrote before how to Customize iTerm2 with Color Schemes, Syntax Highlighting etc. These are must to follow for Syntax Highlighting in Vim inside iTerm2 to get the optimum looking result. I have not written it, where I found I forgot. One person asked on Facebook how to enable the Syntax Highlighting in Vim inside iTerm2, actually it was intended for him. The License of the code is MIT as I do not know the owner. Second version will be full GNU GPL. There is no reason to give me any credit for any means, its quite easy and honestly not coded by me. This Article Has Been Shared 5246 Times! Mac TextEdit Tips and Tricks can reveal some of your unknown or little known features than by default we usually use.We love or hate, TextEdit is a part of OSX. OS X Tips and Tricks lists some of the hidden features, less known features covering both of UNIX origin or added by Apple for their need or forgot to remove. 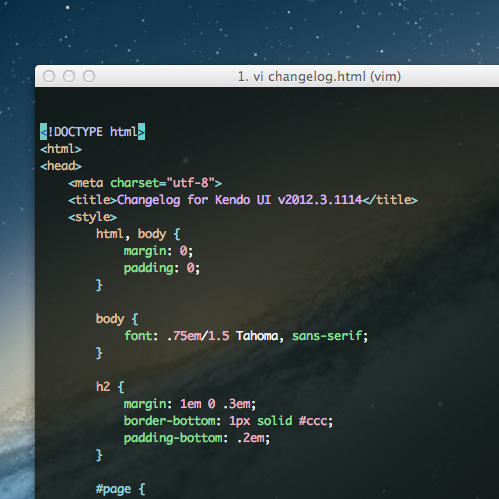 OS X Terminal Transparency, Themes and Syntax Highlighting has been easier to manage with OS X 10.8.3. Here are some tips to get your Terminal looking nice. Cite this article as: Abhishek Ghosh, "Syntax Highlighting in Vim inside iTerm2," in The Customize Windows, March 17, 2013, April 26, 2019, https://thecustomizewindows.com/2013/03/syntax-highlighting-in-vim-inside-iterm2/.